I invited my friend Brenda Yoder to join me here today to talk about ways to cultivate our identity as we release our kids. I know I floundered for quite some time, trying to redefine myself, after my last child flew the coop. My children are spaced out by 13 years, so I had been actively mothering for 37 years by the time that youngest daughter said her marriage vows. I was a mother. I didn’t really know how to be anything else. Now what? Brenda’s beautiful book Fledge: Launching Your Kids Without Losing Your Mind devotes one whole chapter to this subject. Who are you going to be when your children take flight with wings of their own and are no longer sheltered beneath yours? In her book, Brenda speaks truths she has found in the Word of God, and you will be blessed by her practical, transparent wisdom. 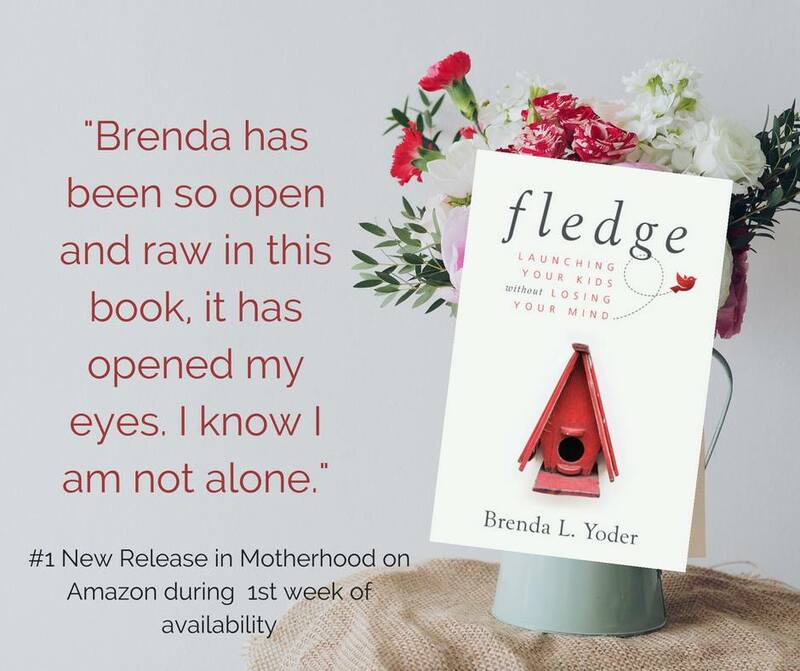 After you’ve read Brenda’s post, be sure to comment below — you could be the lucky winner of Fledge! Fear not, for I have redeemed you; I have called you by your name; You are Mine. In my years of “mom-ing,” I’ve been a basketball, tennis, cross-country, track, soccer, baseball, volleyball, band, choir, 4-H, college sports, theater, and missionary mom. I’ve made meals and baked goods for youth groups, sports teams, and fundraisers, and have helped with more science fair projects than I care to remember. I’m a girl mom and a boy mom three times. I’ve been a stay-at-home mom, a working mom, and a graduate school mom. I’ve been a farmer’s wife, teacher, counselor, writer. The list goes on. I didn’t realize how much these roles defined me until the roles started shifting. As I changed careers and my kids grew older, I realized my identity was tied to what I did, rather than centered on being the woman God created me to be. Once you have children, your identity is likely closely tied to the title of “mom.” A friend said she had her identity crisis at forty when she realized how wrapped up she had been in being the parent of her three children. Another mom said she had her identity meltdown in her fifties, after her youngest graduated from college. My biggest identity crisis was in my mid-thirties when I went from being a stay-at-home mom to a working mom. Since then, what I think about myself is constantly readjusting when my professional or parenting roles change. Do you struggle with your roles changing as your kids leave—or fledge— the nest? Most women do. During the childrearing years, your parenting role becomes your identity. But it’s not. Being a mom is something you do; It’s not who you are. Before you were a mom, you are first and foremost a daughter of God. You are a woman made in the image of God to glorify him in all stages of life—especially after your children fledge. When you first became a mom, did you feel as though you had arrived? Yet motherhood is only one role in your life. And there is life after kids. Women are life-givers to glorify Christ, no matter what stage of life. During the childrearing years, you focus so much on motherhood and caretaking that it becomes your only identity and your priorities get skewed. Enabling and enmeshment happens when we moms fail to help our children grow independent from us and take care of adult responsibilities when it’s appropriate they should. Pulling away from the role of caretaker can be uncomfortable. Caring for your children has been your heart and soul. However, when you don’t cultivate your separate and autonomous identity, you’ll be lost when the last one leaves home. It’s important to distinguish our roles from identity. Think about all the roles you fill (mom, daughter, teacher, etc). These are titles you have, complete with formal or informal job descriptions. But you are a complete, whole person outside of these roles because you are. You are valuable and uniquely designed by the Father of creation—this is your identity. Psalm 139 says you were known by God even before the foundations of the world were established. The entire psalm gives an intimate picture of God’s forethought and his knowledge of and plan for you. You, alone, are enough. Nothing added to you or taken from you will devalue your intrinsic worth in the eyes of God. Unfortunately, you learn the unwritten rule that being a mom makes you valuable. Raising “good kids” gives additional value. Add to that having a great career, charming husband, big house, attractive figure, successful kids, and you’ve hit the jackpot. You’re Super Mom! A great, fantastic person who has it all. If you’ve been striving after these things to define you, you’ll be disappointed when your kids mess up, when the belly fat and premenopausal hormones take over, and when your kids walk out that door. Being a mom is a role you fill. As that role changes during the fledging years, focus on your identity outside of that role. How do you do that? You use your life-giving gifts both in and outside of the family. Focus on your strengths, gifts, and passions. What are they? List them. Give yourself opportunities to use them. Do you love cooking for multiple kids? Make freezer meals and give them to a mom with toddlers and babies. Whatever your strengths and gifts are, use them. Accept your children as separate people apart from yourself. Preparing your kids to fledge involves nurturing and celebrating their individuality that is autonomous from yours. Don’t be offended when your daughter does something different than you do or has opposing thoughts. She’s her own person. You be your own person, too. Accept yourself for who you are. You can feel naked and vulnerable when you’re not in the mom role because you’re faced with things you may not like about yourself. Women spend much our lives trying to create a more acceptable version of ourselves, and being a good mom is one way we do it. Accepting yourself as you are fills the vacuum of an impending identity crisis. It prepares you for the changing roles as your kids leave home. It empowers you to feel comfortable as your body, hormones, womanhood, and parenting roles change. Cultivating your identity apart from your role as mom is one the greatest gifts you can give yourself as your kids fledge the nest. Your strengths should be used in all areas of life, not just motherhood. Your professional and personal roles continue to grow and change as your kids leave. As they do, take your proper identity as a woman of God. One of my readers here will receive a copy of Fledge by leaving a comment below. I’ll draw names and notify you by e-mail after March 13 if you have won. To find out more about everything related to letting go and the fledging stage of parenting, take a look at: Fledge: Launching Your Kids Without Losing Your Mind, available at Amazon right now and other bookstores on March 13. 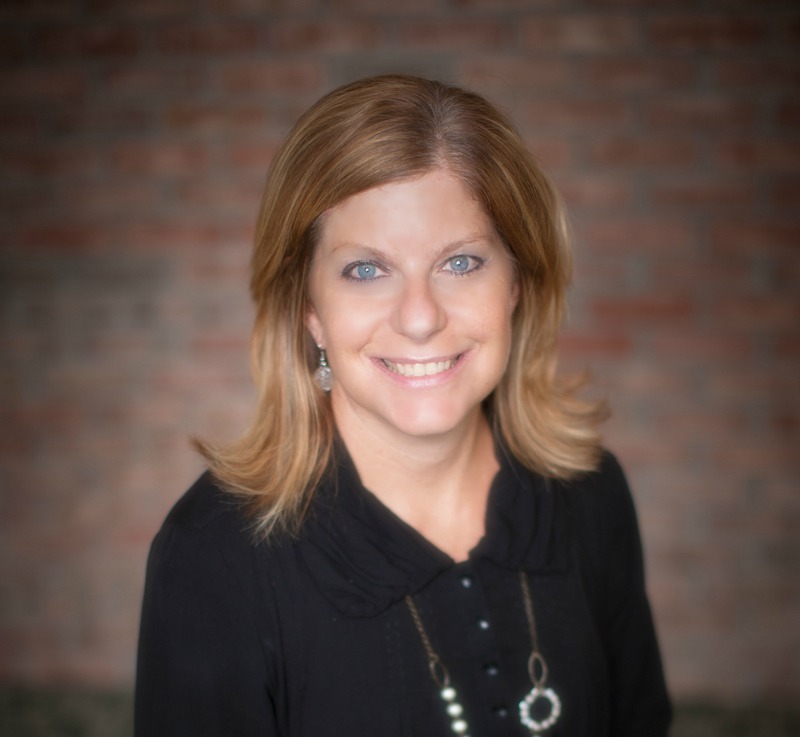 Brenda Yoder is a national speaker, author, Licensed Mental Health Counselor, and life coach whose passion is encouraging others when life doesn’t fit the storybook image. Authentic and humorous, Brenda connects with women and moms in a way that will have you laughing and crying all at the same time. Her new book, Fledge: Launching Your Kids Without Losing Your Mind is a personal handbook for parents in the season of raising and releasing kids. Brenda’s been featured in Chicken Soup for the Soul books: Reboot Your Life and Confident and Curvy; the Washington Post, and For Every Mom. Her first book for busy moms, Balance, Busyness, and Not Doing It All released in 2015. Brenda is also former teacher and school counselor and was twice awarded the Touchstone Award for teachers. Her ministry, Life Beyond the Picket Fence, is found at brendayoder.com where she writes about faith, life, and family beyond the storybook image. Brenda is a wife and mom of four children, ranging from teens to adults, and lives on a farm in Indiana. You can connect with Brenda on Twitter, Facebook, Pinterest, and Instagram. Join her Facebook page to follow the new Fledge Parent Forum for moms releasing their kids. Wow, in that short segment I realize I may be in trouble. While my son is only 13 I feel like my whole world revolves around him and being the best mom I know how to. I look forward to reading your book. Your book will be important to women in that stage of life. I have 2 daughters facing the fledging of their children right now. Your observations are helpful. Reblogged this on Still Waters Coaching. What a vital topic and timely book!